OBJECTIVE: To describe the use of intravenous (IV) therapy in the South African (SA) prehospital setting, and to determine the proportion of prehospital IV cannulations considered unnecessary when graded against the South African Triage Score (SATS) chart. METHODS: The study was conducted in the prehospital emergency medical care setting in the Western Cape Province, SA. Using a descriptive research design, we looked at the report forms of patients treated and transported by personnel currently employed in the public sector, serving the urban and rural areas stipulated by the municipal boundaries. All medical and trauma cases in which establishment of IV access was documented for the month of April 2013 were included. Interhospital transfers, unsuccessful attempts at IV access and intraosseous cannulation were excluded. RESULTS: When graded against the SATS, prophylactic IV access was not justified in 42.3% of the total number of cases (N=149) in which it was established, and therefore added no direct benefit to the continuum of patient care. It is worth noting that 18.8% (n=39) of the IV lines were utilised for fluid administration, as opposed to 9.2% (n=19) for the administration of IV medications. CONCLUSION: In view of the paucity of studies indicating a direct benefit of out-of-hospital IV intervention, the practice of precautionary, protocol-driven prophylactic establishment of IV access should be evaluated. Current data suggest that in the absence of scientific evidence, IV access should only be initiated when it will benefit the patient immediately, and precautionary IV access, especially in non-injured patients, should be re-evaluated. Emergency care providers are responsible for the management and transportation of critically ill or injured patients. These patients often require immediate interventions such as defibrillation or intravenous (IV) therapy. According to Seymour et al., obtaining IV access is a commonly performed prehospital procedure. However, it can potentially have a wide range of complications, including thromboembolism and sepsis. This study sought to investigate and evaluate the purpose of establishing prehospital IV access and to explore issues surrounding justification of this procedure. Prehospital IV access is mainly established for one of two reasons, to administer fluid therapy in the haemodynamically unstable patient or as a drug administration route. Currently, standard procedures state that the predominant means (excluding intraosseous access) involves setting up the entire IV line comprising the selected catheter and the administration set, plus the selected IV fluid bag. Prehospital staff members do not currently have the option of establishing a heparin or saline lock for maintaining IV access. To describe the use of IV therapy in the South African (SA) pre-hospital setting. We first sought to determine the number of peripheral IV lines established during a one-month period (April 2013). From this, we could work out the proportions of cases in which IV access was established for drug administration, for fluid resuscitation or as a prophylactic measure. Finally, we sought to determine the proportion of unutilised IVs that could be regarded as unnecessary when graded against the South African Triage Scale (SATS). This was a retrospective, descriptive study based on the positivist paradigm. It was conducted in a prehospital emergency medical care setting in the Western Cape Province, SA, and was based on patient report forms (PRFs) of patients who were treated and transported by emergency care providers in the Western Cape serving the immediate urban and rural associated areas stipulated by the municipal boundaries. The ambulance station serves a geographical area of 1 538 km2 and a population of approximately 210 000 people spread across rural and urban areas. There is one secondary hospital, situated in an urban area, which receives all yellow, orange and red colour-coded patients within the municipal boundaries. Patients requiring computed tomography scans, magnetic resonance imaging, long-term ventilator support, major surgery or specialist care are referred to the level 1 trauma centre approximately 50 km away. A non-randomised sampling technique was used - all PRFs that met the eligibility criteria were entered into the research project. The target population consisted of all prehospital emergency care providers at a selected ambulance station who were eligible and permitted by the Health Professions Council of South Africa Professional Board of Emergency Care (HPCSA PBEC) to establish IV access. 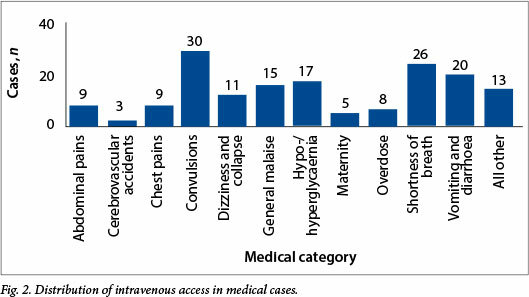 All medical and trauma cases for the month of April 2013 in which establishment of IV access was documented were included in the study. Interhospital transfers, unsuccessful attempts at IV access and intraosseous cannulations were excluded. Children <8 years of age were also excluded, because the HPCSA PBEC does not permit intermediate life support (ILS) providers to initiate IV therapy in this age group. There were 26 ILS providers and 5 advanced life support providers who were permitted to perform IV therapy. The researcher accessed all the PRFs for the month of April 2013. All those that indicated establishment of IV access were selected for analysis. The PRFs were then assigned to one of three groups (A, B or C). Group A consisted of all PRFs in which IV access was established for the indication of fluid administration (i.e. all cases in which 200 - 2 000 ml fluid was given for fluid resuscitation). Fluids included 0.9% sodium chloride and Ringer's lactate. Group B consisted of all PRFs that indicated IV medication administration and included all cases in which medications were administered via the IV route; all other administration routes were omitted. Group C included all PRFs that indicated establishment of IV access, but documented that no fluid or IV medication had been administered (classifying these as prophylactic IV access). Baseline vital signs and the assigned SATS colour codes were documented and entered into a worksheet on Microsoft Excel 2010 for analysis. The colour codes assigned by the attending providers were then reviewed by analysing the baseline vital signs against the SATS. Correct colour codes were confirmed. The SATS was used to determine whether IV access was justified or unjustified based on the descriptions indicated by the colour codes. IV access was considered justified in all cases in which patients were colour-coded orange (serious cases with potentially unstable physiology or potentially life/limbthreatening pathology) and red (resuscitation/physiologically unstable). These triage codes are associated with an increased morbidity and mortality rate. IV access was considered unjustified in all green and yellow colour-coded patients. Ethics approval to conduct the study was granted by the Research Ethics Committee of the Department of Emergency Medical Sciences, Cape Peninsula University of Technology. Access to the PRFs was given by the emergency medical service provider following ethics approval. A total of 242 documented cases in which it was intended to establish prehospital IV access were identified during the study period. Establishment of access was successful in 207 cases and unsuccessful in 31 (n=7 patients colour-coded green, n=5 yellow, n=13 orange, n=6 red); 4 patients refused consent for IV access. According to the study design, only cases in which IV access was successful were included. It was determined that IV access was successfully established in 17.9% (n=207) of the total recorded primary calls (N=1 157). The 207 calls in which IV access was successfully established comprised 166 primary medical complaints and 41 trauma-related calls. 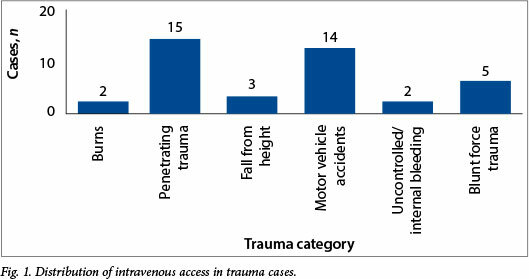 The trauma calls were divided into categories (Fig. 1). In the majority of trauma cases, the chief complaint was penetrating trauma (n=15, 36.6%). The average on-scene time for the documented trauma cases was calculated as 21 minutes. Of the trauma patients, 26.8% (n=11) were colour-coded yellow, 41.5% (n=17) orange and 31.7% (n=13) red. Only 26.8% (n=11) of the trauma patients received fluid boluses, ranging between 300 ml and 2 000 ml. The distribution of the 166 cases in which the primary complaint was medical is shown in Fig. 2. The leading complaint was convulsions (n=30, 18%). This included all actively convulsing, post-ictal patients and compos mentis patients who were reported to have had convulsions as a chief complaint. The second most common complaint was shortness of breath (n=26, 15.7%). This category included asthma, chronic obstructive pulmonary disease exacerbations and other pathologies leading to shortness of breath. It is notable from Fig. 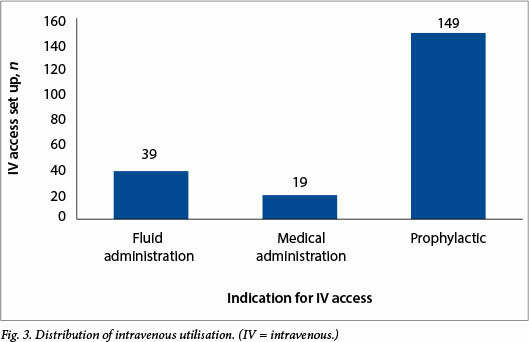 3 that 18.8% (n=39) of the IVs set up for fluid administration were actually utilised for that purpose, as opposed to 9.2% (n=19) of those set up for administration of IV medications. The data that raise considerable concern are the 72.0% of cases (n=149) in which IV access served as prophylactic only. Medications were administered in 9.2% (n=19) of the total cases (Fig. 4). 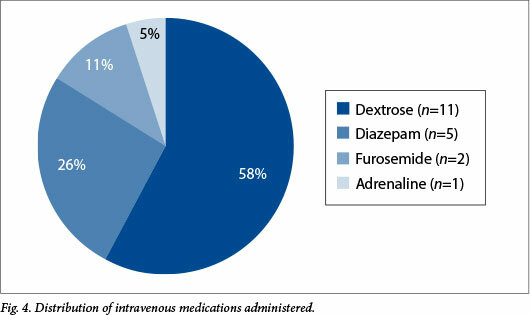 The most frequently administered IV drug was dextrose (n=11, 57.9%), followed by benzodiazepines (n=5, 26.3%). Of the total number of prophylactic IVs established, 57.7% (n=86) were considered justifiable when scored against the SATS. This means that 63 prophylactic IVs (42.3%) were not necessary according to the SATS. None of the patients whose prophylactic IV was considered to be unjustified showed any deviations in their vital signs outside the normal ranges. The study design did not enable us to determine the criteria providers used to determine the need for initiation of prophylactic IV access. Prehospital IV initiation has been a contentious issue for decades. The debate is whether to 'scoop and go or stay and play'. Our results suggest that the majority (72.0%) of the IVs were established with the primary intention of keeping the vein open, should medications or IV access be required at a later stage. This does not appear to aid the continuum of patient care or provide direct benefit to the patient. The other indications were distributed between immediate medication administration and fluid management. Fluid boluses were administered in 18.8% (n=39) cases, ranging from dehydrated or hypovolaemic patients to cardiac patients. Our findings are similar to those of Kuzma et al., who concluded that only 17% of prehospital-initiated IVs were utilised and that 83% were considered prophylactic management. Their findings also suggested that IV utilisation rates were higher in patients with abnormal vital signs. This was our motivation for finding out whether IV placement would be justified according to the nationally accepted SATS. The SATS is a triage tool derived from the Cape Triage Score. It is a combination of the previously used Trauma Early Warning Score and another trauma score, and is currently used in multidisciplinary settings, including the prehospital setting and the emergency department. The SATS ensures that patients who are colour-coded red (resuscitation cases) are a priority and therefore receive immediate attention. The triage system also makes provision for patients colour-coded yellow, who present physiologically as stable, and red patients (resuscitation cases) to be separated from each other by an orange colour code denoting potentially life- or limb-threatening pathology. Schwarzman and Rottman discovered that nearly 95% of patients attended to by paramedics received prehospital IV access, which was set up for prophylactic indications or to administer single or multiple bolus medications. In their experimental study, they established heparin locks directly onto the IV catheter for all patients who needed medications and established full IV lines for all patients who required immediate fluid management. A total of 102 patients were included in the study, of whom 97% were treated with heparin locks, only 4 receiving full IV infusion drips in the prehospital setting, although a total of 20 (19.6%) patients had full IV infusion drips established after being treated in the emergency department. This implies that full IV infusion drips were required by an additional 16 patients in the prehospital setting. Using heparin locks instead of the full conventional drip establishment resulted in a 60% reduction in total cost, and the authors further concluded that heparin locks are a safe, convenient and cost-effective method for maintaining prophylactic or drug access routes in the prehospital emergency setting. In their retrospective case series, Gausche et al. evaluated the concordance between IV access establishment and supply costs. They discovered that patients who presented with chiefly medical complaints were more likely to have received discordant overtreatment than patients who had trauma complaints (61% v. 32%; p<0.001). Their data showed that 73% of patients who presented with chest pain received discordant overtreatment. The study also suggested that approximately 91% of excess supply cost was due to paramedics treating patients via full IV access lines instead of saline locks. Although heparin and saline locks are not currently in the prehospital scope of practice in SA, it can be argued that the use of saline locks for maintaining prehospital prophylactic IV access has potential cost benefits. Our data indicated that approximately 72% (149/207) of patients in whom IV access was established received no immediate benefit from the procedure, as no medications or fluid resuscitation were indicated at the time. Sixty-three of the 149 prophylactic IVs were unwarranted when graded against the SATS. The practice of prophylactic IV access in the prehospital setting appears to have no added advantages for the wellbeing of the patient. The current estimated cost for IV infusion initiation ranges from R48.80 to R151.00, compared with the cost for a saline lock of R5.70 - R14.00 per item (as quoted in April 2013). It can be argued that IV access should be set up in patients who will directly benefit from medications or fluids; however, the costs involved in the establishment of prophylactic IV access mean that it remains questionable. The total estimated costs for prophylactic IV use for the month of April 2013, calculated on the abovementioned quotes (R48.80 - R151.00), was an average of R14 885.10 (R7 271.20 - R22 499.00). Assuming that patients did not receive fluid administration within the first 24 hours of arrival at hospital, a saline lock would probably have been sufficient for maintaining IV access in most cases. This would have resulted in a significant reduction in the costs associated with IV access (calculated as R13 417.45). We could not establish why the prehospital emergency care providers determined the need to establish prophylactic IV access, as a different study method would have been required to elicit possible reasons. Whatever the benefits of a procedure, the HPCSA PBEC, which is the standards-generating body for prehospital emergency care in SA, has a clear set of ethical principles to which providers are obliged to adhere in performing everyday duties. Two main principles are beneficence, which requires the provider to act in the best interests of the patient at all times, and non-maleficence, which means that providers should do no further harm. If providers are establishing IV access prophylactically, the question is: 'What is the risk v. benefit ratio of performing this procedure, and is it considered ethical practice?' There are a number of possible complications associated with the initiation of IV therapy, ranging from local skin irritation to life-threatening air embolism. Zarate et al. determined rates of phlebitis in trauma patients in relation to whether IV access was established in the prehospital or emergency department setting. The rate of phlebitis was 2.92% in patients whose IV access was initiated by a registered nurse in the emergency department, 6.09% when initiated by an emergency medical technician, and 7.78% when initiated by a paramedic in the prehospital care setting. How can a provider who is cognisant of the risks and possible complications involved in performing this procedure justify initiating prophylactic IV therapy that is not utilised? Another factor that makes unused, unnecessary prophylactic IV access initiation unethical is the increased time before the patient is delivered to definitive care. Carr et al.' found that establishing IV access at the scene took between 3 minutes 17 seconds and 5 minutes 40 seconds, which ultimately delays transportation to the hospital or definitive care facility. However, it is not clear whether this brief added time contributes to adverse outcomes. Carr et al. suggest that providers should plan carefully and decide on proper intervals of performing procedures that may result in a significant delay in transportation. This also opens the discussion on performing life-saving procedures en route rather than at the scene, should the individual scenario allow it. Some authors[4,11] suggest that patients with blunt trauma should receive fluid resuscitation to restore compromised organ perfusion and that a permissive hypotensive resuscitation strategy be followed in patients with uncontrollable bleeding. Prehospital fluid resuscitation may decrease blood viscosity, thus increasing flow by disrupting soft early clots. Diluting the clotting factors may also prevent clot formation. Haut et al. concluded that patients who received prehospital IV fluid resuscitation were significantly more likely to die (odds ratio (OR) 1.11; 95% confidence interval (CI) 1.05 -1.17). This was shown to be true for patients with penetrating trauma (OR 1.25; 95%, CI 1.08 - 1.45), hypotensive patients (OR 1.44; 95% CI 1.29 - 1.59), patients with severe head injuries (OR 1.34; 95% CI 1.17 - 1.54), and patients who required immediate surgery (OR 1.35; 95% CI 1.22 - 1.50), and suggests that administration of prehospital fluids has great potential for harm, especially in patients suffering from trauma. These findings also indicate that the routine use of prehospital IV fluid administration in patients with trauma-related injuries (particularly penetrating trauma) should be re-evaluated. This is the first study to investigate the utilisation of IV therapy in the SA prehospital setting. It indicates that a significant proportion of IV infusions are administered prophylactically, resulting in overtreatment and cost wastage. We did not aim to provide reasons for, or explain, what motivated the emergency care providers in deciding which patients should receive prophylactic IV access, as a qualitative methodology design would have been required to explain the phenomenon. We also focused only on medications administered intravenously and disregarded any that were administered via the oral, subcutaneous, intramuscular, buccal, rectal, sublingual or nasal routes. Intraosseous infusions were also excluded from the study, as only advanced life support providers in the study setting had this scope of practice. Intraosseous infusions are usually only established when peripheral IV establishment is unsuccessful. It can be assumed that if intraosseous access was established, there was a clearly identifiable indication for immediate drug or fluid administration, which would be justified by the SATS. Setting up IV access is a commonly performed prehospital procedure. Based on this study, approximately one out of every five patients seen by emergency care providers in the prehospital setting would receive IV access. Of concern was the proportion of these procedures revealed to be unnecessary when graded against the SATS. Saline locks would probably suffice, and result in a major reduction in the cost of maintaining IV access and providing a means of IV medication administration. The question whether the emergency medical services provider should be establishing IV access in the prehospital setting remains controversial. We recommend the development of prehospital IV access establishment guidelines to ensure direct benefit from this procedure.